We were wandering aimlessly on our last full day in Ireland. We decided to pick a town and just meander about. We picked Limerick. We wanted to relax and enjoy “just looking” and breathing everything Irish. A young man was approaching us and I said “good morning”. He stopped right in front of us and asked “are ye on holidays?” We told him we were. And for more than thirty minutes we stood there talking to John. And finding out all about him, and he, about us. And once again, I fell in love with another Irishman. My husband is extremely tolerant. We talked about his life as a bus driver, and later that he worked for Dell (computers), he had been a chimney sweep, and the many other things he did. I told John he sounds like a hard worker. He told me why he worked like that. When they were younger they didn’t have much. His mother, may her soul rest in peace, was just starting to see things change for the better for them when she passed. They were always poor, they worked hard, and their hard work was starting to pay off. I could tell that still bothered him. That his mom did not get to see the changes. While standing there another man came out of a building and started teasing our John. He included us in the teasing. I felt welcomed in that Irish way of smiling with twinkling eyes and percolating laughter. Yeah, just running into old friends on the street. That’s a good life. John laughed with an “aww go on with ye now”. We had to keep backing up to the wall with our backs to the wall so others could pass us on the narrow sidewalk. Much of the time we would be shoulder to shoulder until we gradually moved forward again, just to step back again. I don’t like talking politics. I’m not smart enough to speak for our country, and right now our country is divided, so I know that regardless of what I say it isn’t representing our country. I looked at him and said “you know, I hate to see him fail, if he fails, our country suffers”. 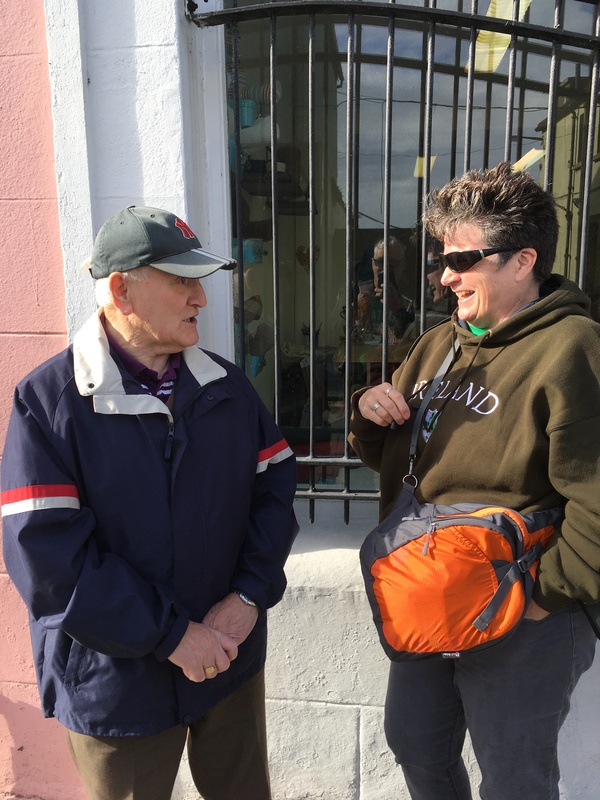 John said “yeah yeah yeah” kind of softly and looked at me with his earnest eyes and said he sees America as free, and it’s an important country to them in Ireland. We talked about the changes in both of our countries, and the things that scare us. It’s not surprising what scares us both, even with an ocean between us. We both worry about the drugs and the kids. We worry about the crazy people in charge. John told us about the music and the dancing. He loves Johnny Cash. Who doesn’t? Oh and doesn’t he like Bruce Springsteen too. John told me he doesn’t drink, he never did, I told him I didn’t either. He pulled back happily and said “ye never did? Really?” I think we bonded over being tea-totalers. I learned a lot more about John than I’m writing here. But I want to respect the man who is now my newest friend. Another passionate and beautiful Irishman I have fallen in love with. What a blessing of a way to wrap up our travels. Another good man met, another friend in life.